This looks AMAZING. In regards to that other PSU you mentioned how does it work? Just and external power pack? Also is it that much more efficient? Curious about 3 things wanting to build an ESXi server. 1) Is there enough space to house a decent active heatsink and do the mounting holes of the HP Heatsink correspond with any stock Intel Heatsink. It’s a tight fit and I can imagine that the HDD’s can run a bit hot being just above the CPU. 2) What is the Max. TDP for this Server. 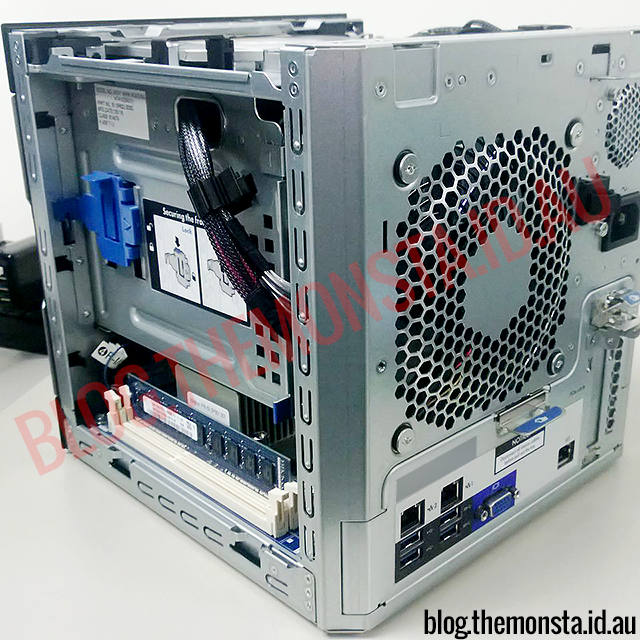 Will it accept a XEON E3 1200 CPU with a TDP of 45W. 3)Will it accept 32 GB of memory. Shame if HP doesn’t add the second Sata Port. That micro SD card may come in handy for putting iso’on it to remotely install an OS from scratch via iLo. 1) Looking at the photos I doubt there is space for a proper active heatsink. About the only thing you could do is mount a 40mm Sunon Fan to the side of the stock heatsink, probably with superglue or similar. I did the same on my older Gigabyte Core2Duo mobos (P35-DS3P & EP45-DS3P) on the Northbridge chip, which enabled more voltage and cooler operation for big overclocks with full stability. 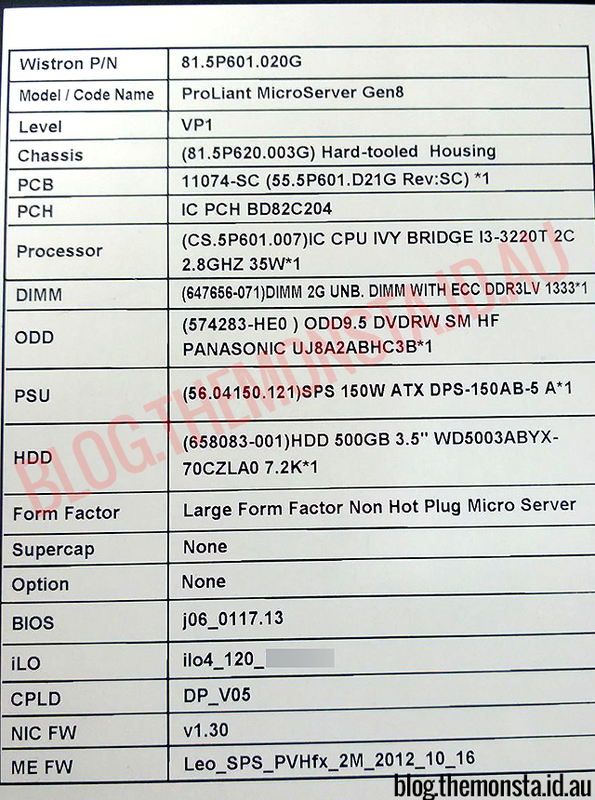 2) Max TDP would be 35W, which is the output of the i3-3220T CPU they fitted to the beta units. Looking at the MOSFET cooling I do not think I would want to push too far past 35W. 3) You are going to buy 2x 16GB DIMMS and put them into a $500 server? 16GB is the official support, 32GB *MAY* work but I doubt it as the Cogar point chipset only supports 48*gb channels for 32GB total. We only have two channels in the G8 so I would be very surprised if 32GB works. If you need 32GB, get a ML310e G8 which supports 32GB and VT-d and other ESXi goodies. From what I have read from the following pages on here is that…. 3) Not that I have read, but the G7 Series said it only supported 8GB but you could run 16GB. I question the viability of a server with 2GB of RAM. While it does kick the arse of any NAS out there, when trying to run multiple VMs you’re going to run into trouble. Then there’s the low end dual core processor. It smashes an ARM processor for power, but not enough to, again, run multiple VMs. Yet it’s not low power enough to compete with the ARM processors out there. It’s kind of like what we needed 5 years ago, but wasn’t able to be made, a bit more RAM & a faster processor & I’d buy one in a heartbeat. It seems like a jack of all trades, & the only way it could win a market share is with price, somehow I don’t think HP will price this anywhere near a cheap 4 drive NAS. Plenty of us are using these units but have upgraded the RAM sortius. I am personally running ESXi on one box with a 2GB Win7 VM for torrents, and a number of 512MB/1GB Linux boxes for various purposes like DNS, HTTPD, MySQL along with a decent Hardware RAID disk subsystem (P410 card with cache, 4 spindle RAID5). It runs multiple VM’s just fine but I definitely would not be pushing large MS SQL Server instances with something like this. For me it is a VCP5 Lab that also runs things I need. That said, in my experience the biggest limiting ESXi performance factor is the speed of your storage, not the CPU. There’s also some users like James Tenniswood using SSD’s in these exclusively – something that has says increases the capacity and usability of these boxes in a big way. If you need something with more power, you are looking at the Acer AC100, with a quadcore Xeon CPU. I do note that it is also only sole with 2GB of RAM also. 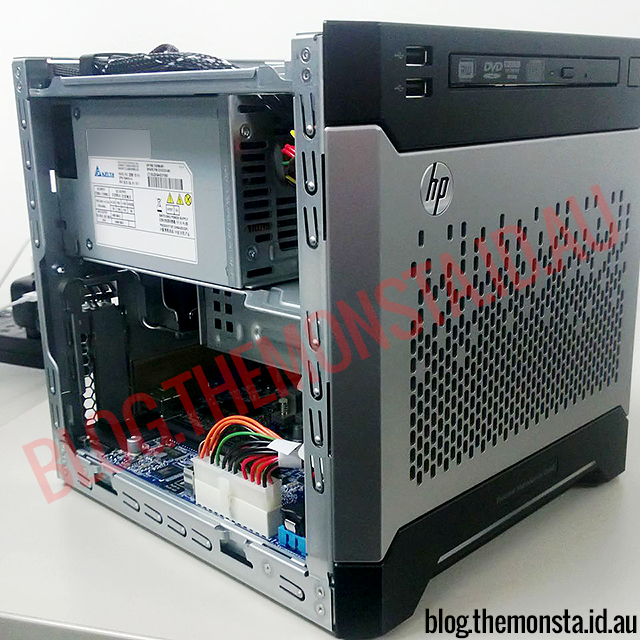 It does miss out on all the HP manageability and helpful features, and is currently up around the AUD$900 mark. I have seen it on special for $599 at times, and it appears to be EOL as although you can get a search result for it on the Acer Website, it has sort of been removed from the Acer Website. I think in the G7 model, at the pricing we were given, we got a very good value machine. In the G8, they have increased the functionality while raising the prices (and margin) which is important for HP so they can continue the product line. If you want something more capable, you can get an ML310e G8 or a similar Dell machine, both of which can be had well under $1000 if you know where to look. True regarding te ML310, it’s more esxi capable… But i like the compact form factor of the microservers. Let’s wait at what price it retails. If it’s close to an ML series then that’s the better option for sure. @ 35W TDP there’s also a Intel® Core™ i5-3470T with Vt-D that would work as well. I’m not running more then 4 lightweigt VM’s and 1 one heavy at any given time. Intel® Core™ i5-3470T also has turbo boost of max 3.6 Ghz. Intel Xeon E3-1220L is also a possibilty @17W TDP if you want to run a low power unit. I can get the Dimm’s cheap 😉 . Doing the math you’re probably right that 16 is the max. The link below shows some possible cpu’s that are 35W TDP and socket 1155.
and a quick compare between the i5 en Xeon. Absolutely there are more CPUs out there that you could possibly use. But at what pricepoint? HP has to make a machine that provides enough power for a ‘Small Branch Office’ situation without pushing the price up too high, and also without cannibalisation of their more expensive products. What they have done is provide a server that has more flexibility an features than ‘Just a NAS’ but at a similar pricepoint and power consumption. The fact that you can get ESXi onto the G8 and have it completely supported, and run 2 low-to-mid duty VM’s without a performance issue is a big tick to flexibility. Until we get some confirmation if the unit is socketed and able to swap CPU’s, all the talk of swapping CPU’s is a little premature. Either way this G8 is a major improvement over the G7 and backwards. 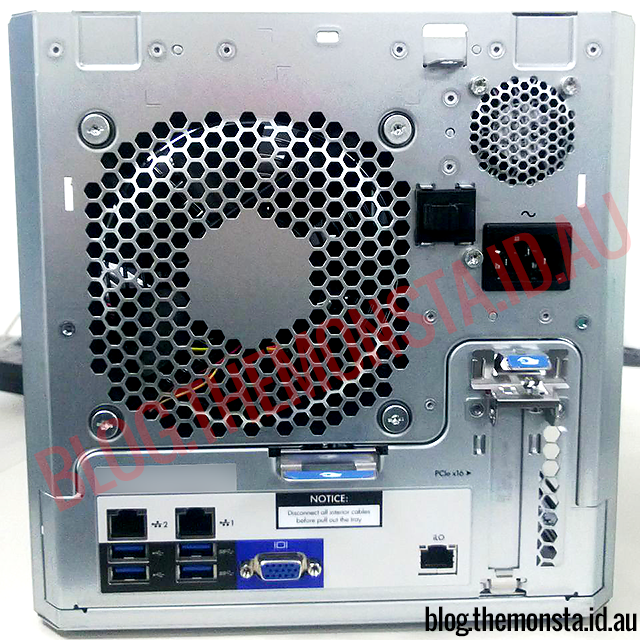 I looked at the ACER AC100 but it also had some limiting factors…. its pretty much just a slighter better machine compared with the G7 in my opinion. The RocketRaid cards aren’t a true RAID at all usually, the vast majority do not work under ESXi either. I cannot recommend them in any way. It just means that if you want some decent power then you buy am ML310e G8, I have seen these well under $900 through a number of local resellers in a ‘barebones’ configuration. 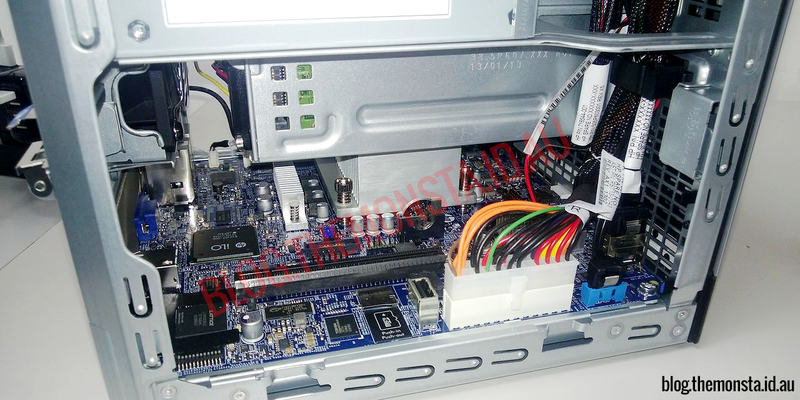 If you don’t mind me asking, how did you mod the pci-e 4x slot to allow a normal pci-e card to be added. I would prefer an internal RAID card but I need to have a 10gbe card in there as well. You cannot “mod the x4 slot” which is a HP Proprietary slot, you have to mod the x1 slot which will not give you enough bandwidth. I am using an NC360T (dual GbE ports) rather than a 10GbE. A PCIe x1 slot gives you almost enough bandwidth for two Gigabit ports but will not come close for enough for a 10GbE card. In a nutshell, you need to modify both the x1 slot and the x4 slot so the ‘middle ends’ are open, and then tape Pin 19 onwards of the card so that it is electrically insulated. I do have another N40L to modify this way and will be doing it over the weekend hopefully. Will snap some photos and put a post up a HOWTO once it is done. Thanks for your quick reply – I’d love to see the “Howto”. I potentially want to run a RAID card in that slot (so use that rather than the AMD RAID) and use the PCI-E x16 slot for the 10GbE card. Not sure if its worth it or if there are any decent x1 slot RAID cards which would beat the pants off the internal RAID speeds. I just purchased this until and have upgraded the memory to 16GB and with the plan to install the OS and some VMs onto a 2.5″ SSD mounted into the Optical drive bay. 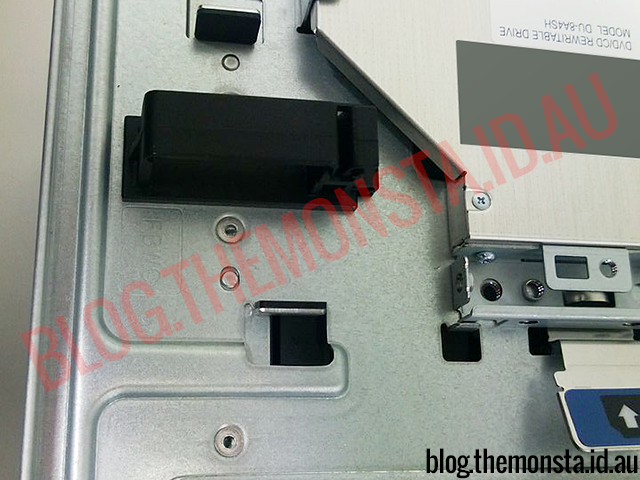 All data would reside on the 3.5″ drives. All good in theory, plan has fallen down as I actually connot figure out how to connect the drive to the mainboard, (very basic issue I know) does anybody have an idea on this one? Would be a shame to lose out on that flexibility. yes I also wish to know after installing the 4 3.5″ drives where to connect an SSD to use for booting up the machine or cache (ZFS). Any hint if it’s possible to implement this set up?